The Ukrainian crisis is far from being over. However, no sober dialogue is taking place. Yet, it is high time to consider all the circumstances quietly, in order to minimize the risks. 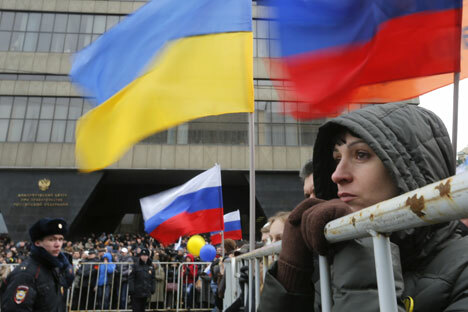 Russia’s decision, with respect to Crimea is irreversible. It is an illusion to count on something else. Undoubtedly, political will relies upon the broad support of the population of both the Crimean peninsula and the Russian Federation. Since the collapse of the USSR, there has been a belief, both in Crimea and in Russia, that the fact that this territory belonged to Ukraine was a historical accident, a misunderstanding and an injustice. The fact that, according to the survey conducted last year, a little more than 40 percent supported joining Russia (those who dispute the results of the referendum point out this figure) does not matter much. No one could have even imagined then, that this was at all possible, yet now, the citizens were actually invited to choose their own destiny. The return of Crimea to Russia was only possible because Ukraine had begun to fall to pieces on its own. It was almost impossible to imagine this even in mid-February, and of course, there was no plan. However, once it all began by itself, no one could resist the temptation to correct this historical mistake. The President of Russia, of course, did not want to be remembered as a person who missed a real chance to reunite a territory of such great cultural, political and strategic importance to Russia. A hypothetical cancellation of the decision on Crimea’s annexation would mean a political and moral disaster for the Russian leadership. This is impossible to even imagine. Sanctions have an opposite effect. It would be naive to believe that the pressure regime, applied against countries like Yugoslavia, Iraq or Myanmar, could work in the case of a nuclear superpower, occupying most of Eurasia and having strong influence all over the world. (It did not work in the earlier mentioned cases either). Russian experts have no doubt that the United States and Europe have the ability to seriously injure Russia’s economic interests. The blocking of Visa and MasterCard systems has become a clear demonstration of this power for some Russian banks, i.e., showing who is the master in the world. Needless to say, that in taking the decision concerning Crimea, the Kremlin analyzed the possible price it would have to pay, and thus, this was no surprise. This pressure only consolidates the Russian establishment, strengthening their resolve to defend their positions. In addition, such gestures as adding, for example, the Minister of Defence of Russia, i.e., a person on whom, without exaggeration, global stability depends, to the “black list”, are absurd. As far as we can judge, there are no plans for further operations on the territory of Ukraine, which seem to scare Kiev and the West so much. Moscow understands the difference between the sentiments in Crimea and the atmosphere prevailing in the east and south of Ukraine. Residents of these areas are loyal to Russia and have a reason for preserving these ties, but there will be no such unanimity as was the case on the peninsula. There is no clear line separating the “pro-Russian” regions from the others, as Ukraine is a heterogeneous and diverse country. There is only one scenario when Russian interference in the affairs of eastern and southeastern Ukraine is possible, if not inevitable, and that is a dramatic destabilization. An outbreak of civil confrontation provoked by, for example, an attempt by the Kiev authorities to take control of the ultra-radicals and a terror response on their part. A desire of the government, where a significant role is played by extreme nationalist forces, to extend the cultural model of Western Ukraine to the entire country. An acute economic crisis, a wave of bankruptcies of enterprises in the east and the authorities’ attempts to suppress mass protests by force. A political split caused by the upcoming presidential elections. There are many negative scenarios, and their implementation would put Russia in a difficult position. Side effects of an intervention are obvious, and success is not guaranteed. However, in the event of a sharp deterioration of the situation, the radicalization of sentiment, the emergence of serious groups asking Moscow to help their compatriots, inaction may become unacceptable. Russia is experiencing a period of searching for a new national identity, to replace the Soviet one, which has exhausted itself already. Like in other countries that have passed through similar transformations, the national feeling is growing more intense. Russia wants the situation in Ukraine to calm down, and it wants the country to rise to its feet, after the actual collapse of the political system. Moscow is convinced that the only way to achieve this goal – is through the reorganization of the state on other principles. This would be a federative or confederative Ukraine, one that could guarantee the possibility for linguistic and cultural self-determination for different regions (states, cantons). They could build their own economic strategies, in accordance with their interests and desires, focusing on familiar partners, be they in the East or in the West. Naturally, Russia’s allergy to Ukraine’s membership in NATO has not gone away, and a neutral status is a prerequisite for any success. With all due respect to the Ukrainian people, it is impossible to create a sustainable model for the development of Ukraine without an agreement of the external forces – Russia and Europe/USA. Due to its geography and history, Ukraine is unable to make a choice, and now we can see what an attempt to force it to do so, has led to. Of course, the Crimean conflict has made communication much more difficult, but it does not deny the urgent need for talks. Russia and the EU need to hold some extremely serious talks about Ukraine, and during the first stage, these should be completely confidential, to avoid any collisions of prestige and ambitions. It is clear that it will be difficult for parties to overcome these, and Europe will refer to the fact that it is impossible to discuss the fate of Ukraine, without the object of such discussions being present. However, unfortunately, this situation is extraordinary and fraught with very serious convulsions, and thus requires totally non-standard measures. The Ukrainian crisis completes an entire era in European and world politics, showing that in the past, no stable and capable control mechanisms were ever built. Any turning point is always dangerous, but it provides an opportunity – an opportunity to agree on new rules of the game. Fyodor Lukyanov is Chairman of the Council for Foreign and Defence Policies and Editor in Chief of the journal Russia in Global Affairs.